Did you know that the simple goldfish you purchased at the pet store or won in a ring toss game at the fair could lead a wonderfully long life (and this means longer than a year) to up to twenty years or more? Could this be true? You may have the misconception goldfish are easy pets for which to care. This is a main reason why parents buy a goldfish for their children as “the starter pet.” Truth is, goldfish aren’t as easy to care for as you would be led to believe. A cartoon fish loves swimming around in the well recognized fishbowl but in reality, the fishbowl is nothing but a death sentence for your goldfish! What would be more in line for your goldfish would be a five or ten gallon tank capable of meeting your goldfish’s specific requirements. Depending upon your goldfish type you may need a larger tank than recommended above. For instance, the common single tail goldfish (commons, comets, and shubunkin) require tanks of up to 75 gallons! Commons also survive nicely in ponds and your fancies (double-tailed goldfish), will adapt to a 20 gallon aquarium (and the recommendation is 20 gallons per fish). Goldfish produce a lot of waste due to their vegetarian diet. For this reason a tank filter is required. Without a filter, ammonia poisoning could kill your fish! If you notice the goldfish’s skin, gills, and fins turning blackish it means your fish is being poisoned by the ammonia its excreting. This will eventually lead to death. So make your fish happy and filter your tank (in some cases double filtration should be used). Deoxygenation can have your goldfish dying from the lack oxygen in the water. Without a pump they could suffocate and drown. You may see your fish begging for more food but in reality it’s gasping for air! You could also use an “air stone” for more air but you’ll need a large tank to create enough surface movement for dissolving new oxygen in the water. If the air stone isn’t working then a pump is needed. Correct water temperature will make your goldfish smile all day and night! A minute temp change can stress your goldfish and bring on some immune system problems. This will make your goldfish more susceptible to disease and parasites! 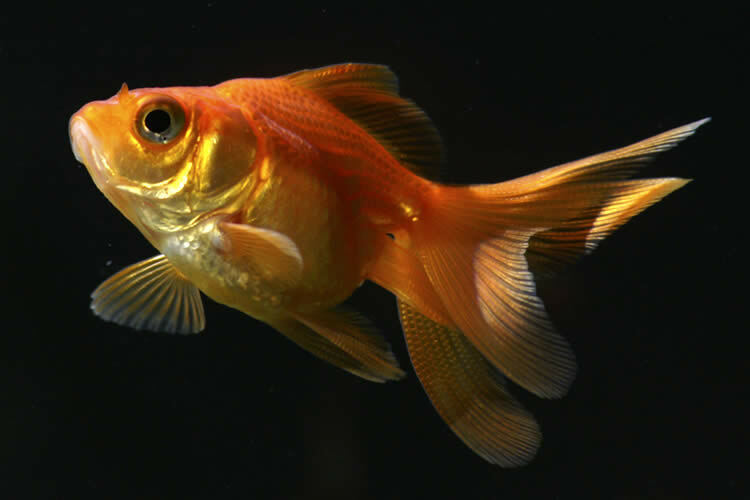 Your goldfish should be constantly swimming and not bobbing, floating or sinking. Make certain your fish are eating regularly and eliminating their waste frequently. Providing your goldfish with a varied diet will help immensely, so mix it up! If you’d be eating pellets every day you’d become bored with the food too! Vary their diet with treats like spinach, peas, shrimp, or Daphnia. Your fish’s appearance should be shiny. Dull areas on the scales (and dull eyes) should be addressed immediately. A stressed fish is a very unhappy fish! The relationships with their tank mates should be closely monitored. Aggressive fish should be moved to another tank before something bad happens. Never mix goldfish with tropical fish. Goldfish should be kept with their own kind but don’t crowd the tank. They are a social fish so fish friends are important. A less stressed fish is a happy fish! Aquarium lights turned constantly on and off make your fish unhappy. Goldfish do not have eyelids so a dimmer or timer may be necessary. Never resort to the small goldfish bowl. Make the small bowl a thing of the past. The small goldfish bowl is actually a myth which stems from Chinese tradition. Chinese and Japanese fish keepers would place their fish in small bowls to show off to their guests. They’d then, after their guests had left, return the fish to their pond because a fIsh in the pond is happier than a fish in the bowl! The Nest.com: How to Tell If Your Goldfish Is Healthy & Happy?